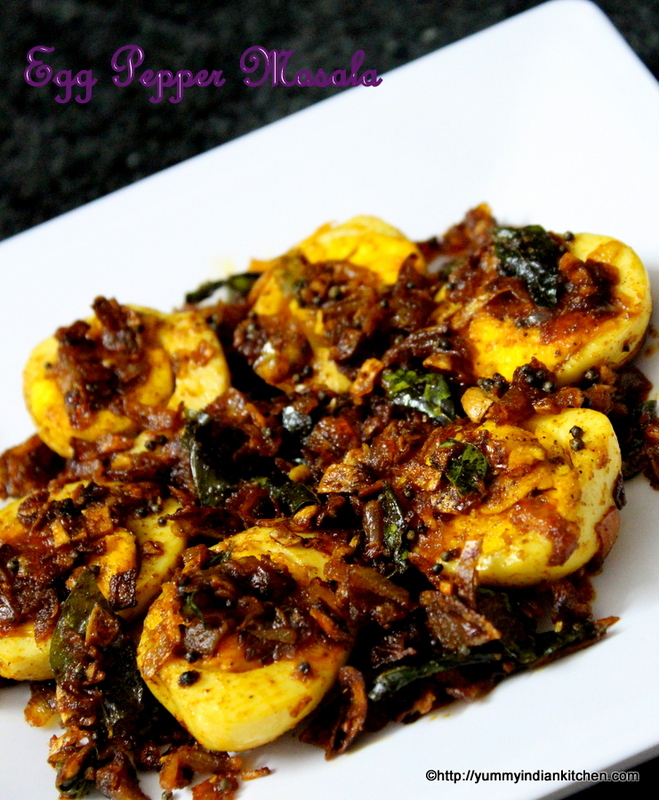 Egg Pepper Fry is the most delicious and quick egg dish which can be done in a couple of minutes. The egg pepper masala is an instant recipe with no hard work and all we need is few boiled eggs and black pepper powder handy. This dish goes best with roti or rice and is a yummy egg dish with just few spices and eggs stir fried in some oil. I tried my hands at this dish in south indian style by adding some mustard seeds and curry leaves and it turned out awesome in flavor. 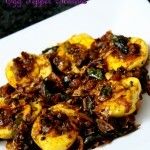 Also other egg recipe is egg masala which is a gravy curry made using fried boiled eggs in onion tomato gravy. Eggs can be fried in many ways and I would love to update them with different kinds of preparation and also roasting/frying them in various ways. In different regions egg is fried in different way and I would like to post the best egg recipes to be tried by my blog readers. This is a very common style of roasting or frying boiled eggs in andhra style or south indian style. We prefer to add in some tempering ingredients to stir fry certain recipes be it egg or vegetables and it really gives an aromatic feeling. I usually fry eggs with basic spices as eating plain boiled eggs with rice or roti gets boring and therefore each time I fry egg I try to roast it or fry in different ways possible and it simply turns out awesome. 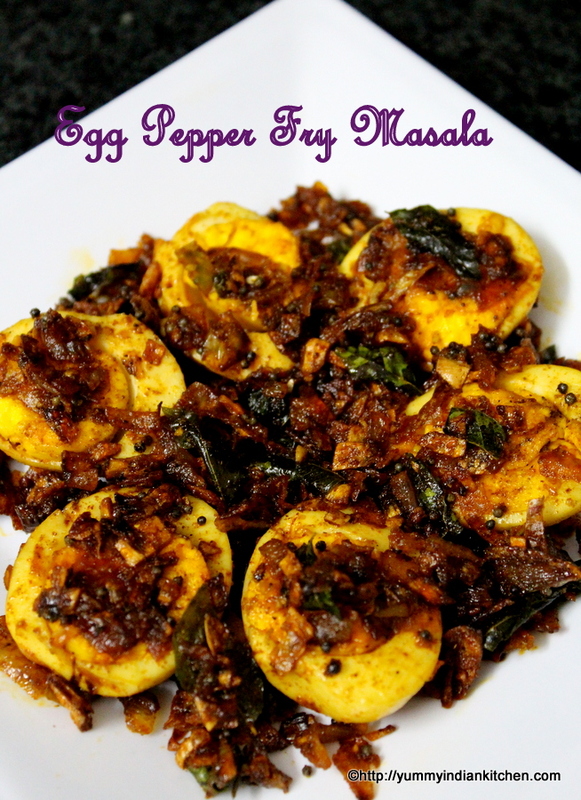 This egg pepper fry needs hard boiled eggs and some spices mainly kali mirch powder/black pepper powder and few onions along with dry spices and few minutes to cook it up and one can surprise your loved one’s with this amazing egg pepper masala fry. Firstly, take a non stick wok, add oil into it and heat it. Into it add mustard seeds and let them crackle. Add green chillies and curry leaves into it. Add finely chopped onions into it and saute until they turn soft. Add dry spices such as salt, red chilli powder and turmeric powder, mix. Cut the boiled eggs into two halves and add into the masala. Add/Sprinkle black pepper corn powder all over the boiled eggs. Toss the whole mixture delicately and let it cook for few minutes on low flame. Flip the eggs carefully and cook the other side too. Make sure the eggs are stir fried and coated well on both sides with the masala for few minutes. Serve with rice or roti as a side dish along with dal or curries. 1.If one would prefer less spicy then add black pepper powder according to the level of spicy taste. Hi!!! Tried this today and it came out so well. Added a tomato as well. Thanks for this. It’s fool proof!